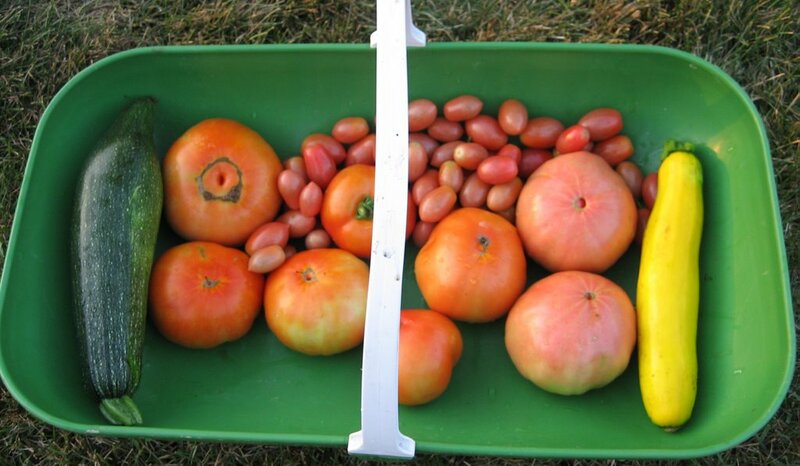 'Maters, yep, I'm starting to pick a lot of tomatoes. That's the way it seems to go. Waiting, waiting, waiting for the first tomato to ripen and then overnight it seems they all have figured out how to ripen and each day yields a few more tomatoes, then a few more and then a lot of tomatoes. I swear these tomatoes pictured here were solid green Saturday morning, and then Sunday night, they called out to be picked. And then this evening (Monday) there were six more tomatoes that just showed up red and I picked them, too. Now I have an abundance of tomatoes, enough to eat and then some. If you are looking at some of those tomatoes and wondering if I picked them too soon, rest assured that I didn't. I find I do better picking tomatoes about a day or so before they are completely ripe and then setting them out on the windowsill to ripen the rest of the way "off vine". I have less fruit that cracks or splits open that way and I don't think it affects the taste. And, I love those cherry tomatoes. I just wash them and set them in a bowl on the counter and eat a few every time I walk by. Yum! The variety is "Sugary", and I highly recommend them. If this tomato harvest keeps up, and there is no reason why it wouldn't keep up at this point, I'll have more than enough tomatoes by the weekend to make salsa, with Anaheim and Jalapeno peppers that are just waiting to be picked. I like a salsa that doesn't taste all that hot when you first try it, but then the heat sort of sneaks up on you and before you know it, you have beads of sweat on your forehead and you need a big drink of water. And because your brain is releasing all those endorphins that make you feel so good, you want more. Anyone have a recipe for a salsa like that? 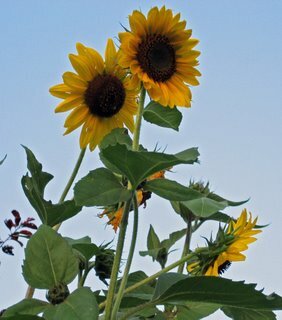 Just down from the tomatoes I have these "Autumn Beauty" sunflowers. I always plant some flowers in the vegetable garden because I think it just makes it all look a little nicer and more inviting. My estimate, without measuring, is that these sunflowers are 8 or 9 feet tall. And finally, here's a picture of the garden last night as the sun set, following a good soaking with the sprinkler. 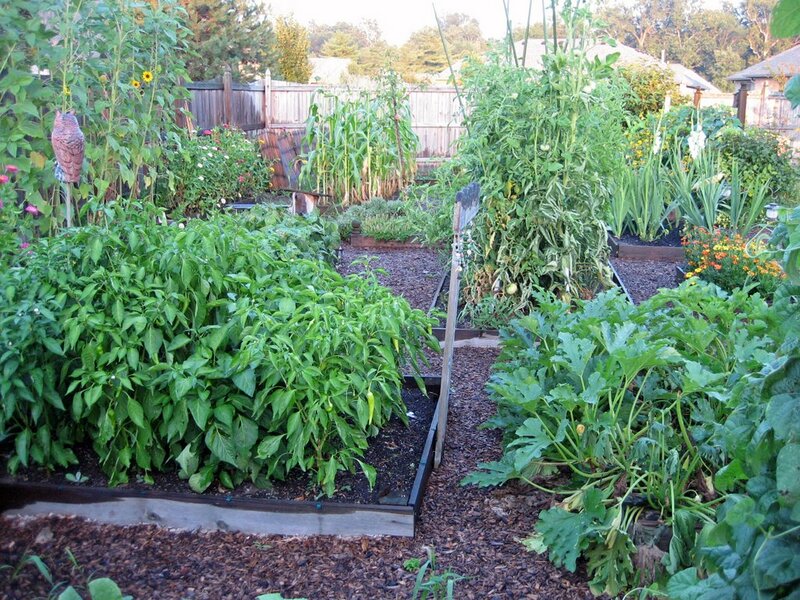 There is certainly abundance in the garden now, at least with tomatoes and peppers and even a few zucchini's. No comment on the beans and corn. Okay, one comment on the corn... I did harvest another ear this evening and gave it to someone else to try. They reported it was "succulently delicious". I sure wish I had more corn. But soon I should have eggplant to harvest, which may make up for not having much corn. Okay, who am I kidding, I want more of that corn! 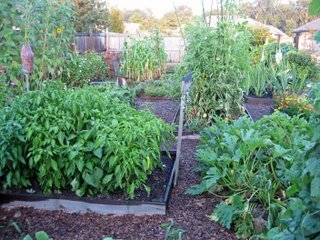 Fun garden blog! I've been gone a few days and hauled in a basketfull tonight. All we had for dinner was a big salad from the garden. I'll have to put those little tomatoes on my list for next year. A veg gardner too! Great. Don't mention the corn! And you gave it away...! Funny how each year there is a disaster in the gareden - corn this year, garlic last year and it just makes you want it so bad! Thank heavens for the little tomatoes! Our slicers are over, darn it. There are still some Juliets coming along, because I'm a walk-by tomato snacker, too. If I see 'Sugary' next year it'll be tested here, too. My husband is the salsa maker. It's never exactly the same, but roasted poblanos are always one ingredient, and he's a major garlic fan, too.